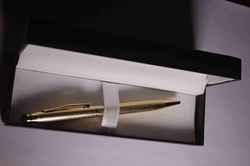 Owing to rich industrial experience, we are involved in offering best quality of Gold plated Pens . These Gold plated Pens are available in elegant design. With enriched industrial experience and knowledge, we are providing our clients with a wide assortment of Gold Color Branded Pen. Designed with utmost precision, the offered pen is designed using advanced technology by our vendor’s talented designers. We are well-known among our patrons, engaged in wholesale trading a high-grade range of Robomax Gold Pen. Leveraging on our vast industry experience, we are providing a high quality range of Gold Plated Pen. 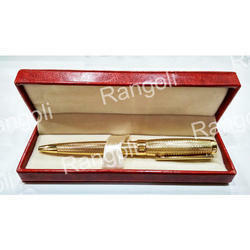 We are engaged in offering Gold Plated Pen. The offered range of gold plated pens is available in customized designs, colors, shapes and sizes to append and respond to the diverse demands of respectable clients.